Your stomach is prone to many threats, as anything ingested through the mouth ultimately ends up in the stomach. Your stomach tries its best to break down all that enters, but sometimes it falls victim to ulcers, bacteria, and other health ailments that can compromise the stomach’s ability to perform its job. Research suggests that regular consumption of a popular superfood can help protect the stomach from all of those threats, and reduce the risk of stomach ulcers and even stomach cancer. So what is this superfood? A small Japanese study found that eating 2.5 ounces of broccoli sprouts a day can work to reduce the risk of stomach ulcers and stomach cancer. 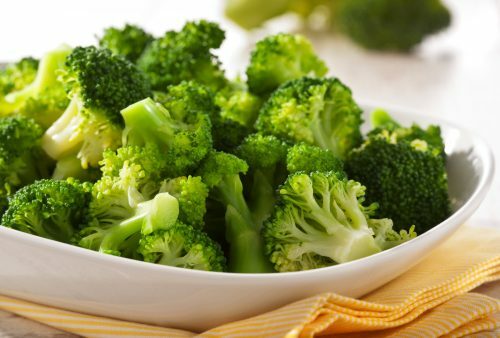 So far, broccoli consumption has been associated with the reduction of the cancer risk in the esophagus, bladder, skin, and lungs. The ‘magical’ component in broccoli is known as sulforaphane, and in previous research, it has been shown to lower the levels of H.pylori, a stomach bacterium associated with stomach damage. For the study, Japanese researchers looked at 48 individuals with H.pylori. The study was conducted in Japan, as they have high rates of H.pylori. While in the U.S. 25 to 30 percent of people are infected with H.pylori, in Japan the numbers are creeping up to 90 percent. Half of the study participants consumed 70 grams of broccoli sprouts a day and the other half consumed alfalfa sprouts, which do not contain sulforaphane. After the eight-week study, H.pylori levels were significantly reduced in the broccoli sprout group, and there was no reduction in the alfalfa group. Although you can take a sulforaphane supplement, the researchers suggest incorporating more broccoli and broccoli sprouts into your diet for optimal results. They also noted that garlic can have the same effects, too. Overall, the researches recommend incorporating more plants into your diet in order to ward off health problems.